INSIDE OUT is the phenomenally successful new Pixar movie from the directors of two films I really adored - UP and RATATOUILLE. It's smart, witty and beautifully imagined and rendered. But for some reason it just didn't connect with me on an emotional level. In fact, two days after seeing it, the thing I remember most about my movie watching experience was the Pixar short film, LAVA, that preceded the feature. I can still sing that song and feel moved by the plight of the little volcano hoping for love. INSIDE OUT was clever, and pretty, but I'm just not sure it's going to stay with me in that way. This is often the problem with high concept film. 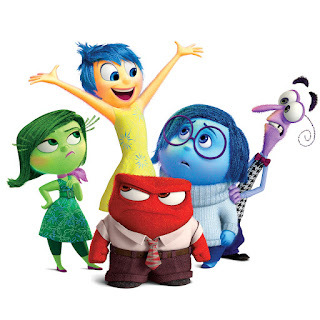 INSIDE OUT posits a world in which our emotions are neatly split into five key feelings, and whichever of these controls our mood generates our memories and our feelings. So, at first glance, our protagonist is an eleven year old girl called Riley, struggling with moving across country with her family, feeling pressured to keep a happy face for her stressed out dad, but inwardly hating it all. But the real star of the show is Riley's emotion, Joy, played by Amy Poehler (PARKS & RECREATION). Joy has, up to this point, been largely in charge of Riley's emotions resulting in lots of happy memories. And Joy ascribes part of her success to keeping Sadness (THE OFFICE's Phyllis Smith) firmly off the controls. So the coming of age journey is not really for Riley but for Joy, as she learns that everyone needs a little sadness to make the happier times happy by contrast. And sometimes a good cry, admitting your suffering, allows others to reach out to you and for you to resolve, rather than smother, your issues. So in that sense, this is a radical children's movie, for while it still gives us a happy ending, that happiness is conditional on admitting that it's okay to be sad. All of which is a valuable life lesson. And within that life lesson we get a lot of smart thinking. For the plot is motivated by Joy and Sadness being kicked out of the emotional HQ and into the outer reaches of Riley's mind, trying desperately to get home. On this yellow-brick-road like journey they meet characters that help them including Riley's old childhood imaginary friend, her imaginary boyfriend from Canada, and the scurrilous mind-caretakers who keep sending annoying advertising jingles to the forefront of Riley's mind. The look of the film is like an old-fashioned amusement park, complete with the train of thought and Imaginationland. I also particularly love and admire the animation skill that makes the emotions feel like little balls of energy complete with fizzing soft outlines rather than the typical hard pencil line. I really do admire INSIDE OUT. But again and again I kept finding emotional scenes just didn't get to me. Maybe that's my fault. Maybe it's just weird to attach yourself to a protagonist and then another inner protagonist. Maybe the film spends too much time on clever thinking and not enough on emotion. If so, that's a really ironic result. INSIDE OUT has a running time of 94 minutes and is rated PG in the USA and U in the UK. The movie played Cannes 2015 and is currently on release in the USA, UK, Egypt, France, Morocco, Tunisia, UAE, Argentina, Australia, Azerbaijan, Bolivia, Brazil, Belarus, Chile, Colombia, the Czech Republic, Dominican Republic, Croatia, Israel, Kuwait, Kazakhstan, Lebanon, Macedonia, Peru, Puerto Rico, Portugal, Serbia, Russia, El Salvador, Ukraine, Uruguay, Bulgaria, Canada, Cyprus, Sri Lanka, Latvia, Mexico, Panama, Pakistan, Romania, Turkey, Venezuela, South Africa, Belgium, Hungary, New Zealand, Bangladesh, India, Kenya, Paraguay, Poland, South Korea, Netherlands, Spain, Japan, Hong Kong, Ireland, Trinidad and Tobago, Estonia and Taiwan. The movie opens on August 12th in Thailand, on August 14th in Lithuania, on August 19th in Indonesia, the Philippines, on August 20th in Georgia, Cambodia and Malaysia, on August 21st in Malaysia, Norway and Vietnam, on August 27th in Denmark and Singapore, on August 28th in Finland and Sweden, on September 3rd in Greece, on September 16th in Italy, on September 24th in Jordan, on October 1st in Austria and Germany and on October 8th in China.